Should You Target A Mid-Round Quarterback? Many of you have already spent months voraciously preparing for the 2015 fantasy football draft. Reading an endless collection of material, scouring the latest updates, perusing statistics, comparing the various strategies that exist within the fantasy community, and compiling your own rankings. All to construct the shell of a plan before your draft finally begins. In those final moments before you make that first selection, you will hopefully experience the exhilaration that comes from knowing that you are definitely ready. This article is designed to help you achieve that feeling, by knowing exactly how you want to pursue the selection of your quarterback. Both in terms of who you should target, and at what point of the draft you should eschew your options at running back and wide receiver in order to secure him. Any temptation to seize a top tier quarterback, which in my rankings consists of four options - Andrew Luck, Aaron Rodgers, Peyton Manning and Russell Wilson - is very understandable. That allows you to lock in one of the few signal callers who are most likely to provide consistent, high quality production for your team. But that forces you to invest an early round selection on a member of that select group. Because Luck and Rodgers will be gone well before Round 5, and there is great likelihood that Manning and Wilson will join them. That in turn will compromise your ability to build a stable of wide receivers and running backs, while your most prolific options are still available at those positions. If you don't choose your quarterback in the early rounds, you must determine whether to grab one of the viable options that will be available to you in the middle rounds, or to continue exercising patience by waiting until the later rounds. There are varying opinions regarding what constitutes the middle rounds, and when the late rounds begin. For the sake of this discussion, we will consider Rounds 6-9 to be the middle, and all rounds that contain double digits will comprise the late rounds. You can find analysts who at best, consider drafting a quarterback during the initial rounds to be an archaic draft strategy, and at worst view it as borderline criminal. But the allure that exists with these elite options is understandable. And if you experience a certain comfort level by having Luck or Rodgers as your starter, it is still your team, and you should build it however you prefer. However, I do not endorse this as the best approach. Your chances for success improve by waiting until at least Round 5 before drafting a QB, which will allow you to secure two running backs two wide receivers while you still have a reasonable number of appealing options at each position. And if you can avoid taking a signal caller until even later, that will enable you to assemble even more firepower at wide receiver, and especially at running back. That remains the position most fraught with pitfalls during both the draft process, and the regular season. You will absolutely find a greater degree of depth at quarterback, which is a primary reason to avoid investing one of your critical early round selections on a signal caller. An immense collection of statistical data currently exists that validates the assertion that you will find more viable options at quarterback than you will at the other critical positions once your draft has progressed into the middle rounds and beyond. You should be very familiar with that premise at this point. However, here are more numbers to underscore that point even further. 10 years ago, Carson Palmer was the only quarterback to generate 30 touchdowns. In 2010, that number rose to five, then remained stationary for four seasons. But look at the big jump in that category last season. The number nearly doubled, and provides an excellent illustration of the increased depth that now exists at the quarterback position. Even if that number is not duplicated this season, the trend toward having more quarterbacks producing at least 30 touchdowns should continue both this season and beyond. Which demonstrates further that is not necessary to reach for your signal caller in the early rounds. Once Luck, Rodgers, Manning and Wilson have been selected, you still have an assortment of viable options. Drew Brees is likely to disappear from your draft board in Round 5, which still leaves a large group of QB1 candidates with only a small degree of separation between them. How will you determine your preference between Ben Roethlisberger, Matt Ryan, Tony Romo, Tom Brady, and Cam Newton, once your draft has entered the sixth round? Or do you want to wait delay your selection until Round 8 or 9, when Eli Manning and Ryan Tannehill, and Matthew Stafford become your most appealing choices that remain available? You can also choose to wait until the late rounds, which will be examined in my next article. But for those of you who prefer to draft your quarterback in the middle rounds, the information that follows is designed for you. The signal caller that you select can go a long way toward making or breaking your fantasy season, and as mentioned previously, the differences between the sixth ranked quarterback, and the 12th ranked quarterback are not immense. You are already familiar with the quarterbacks who are about to be discussed, but that familiarity often does not equate to knowing exactly how you should prioritize your rankings beyond those limited elite options. Keep reading, and you should be able to transform what might appear to be a murky mess into your new rankings. One year ago, his ADP was only 125 in drafts at fantasyfootballcalculator.com, and he was just the 17th quarterback selected during the draft process. Andy Dalton, Robert Griffin III, Colin Kaepernick, and Jay Cutler were among the massive group of signal callers that were taken before him. But Roethlisberger’s value has soared after his 11th season under center was also his most prolific. He generated a career best 4,952 yards, tied his career high with 32 touchdown passes, registered his best completion percentage ever (67%), and only threw nine interceptions. All despite launching the most attempts of his career (608). Roethlisberger's yardage total tied him for the NFL lead, and he also finished seventh in touchdowns. As a result, Roethlisberger is currently being selected in the sixth round of 12 team leagues, and his ADP has essentially been cut in half (62). Anyone who makes that level of commitment to secure him will be rewarded with a yardage total that approaches last season's output, along with 30+ touchdowns. Because the personnel who combined to help the Steelers' aerial assault rank second in 2014 will return intact. Starting with Antonio Brown, who led the NFL with 129 receptions, and paced all receivers with 1,698 yards. Brown has now averaged 119 catches and 1,598 yards during the past two seasons, while demonstrating that he is matchup proof. He will help boost Roethlisberger's output again. As will second year wideout Martavis Bryant, who collected eight touchdown passes from Roethlisberger as a rookie, despite not performing in Pittsburgh's first six contests. Plus, Le'Veon Bell showed that he is just as lethal while garnering receptions as he is generating yardage on the ground when he stockpiled 83 catches in 2014. While there are many reasons to target Roethlisberger this summer, be prepared to grab him earlier in the draft then you may prefer. Or, you have an excellent chance of receiving similar output by waiting a little longer in your drafts before selecting a signal caller. Because that level of production should also be attained by many of the other options discussed below. Some of which will be available at least two rounds later. 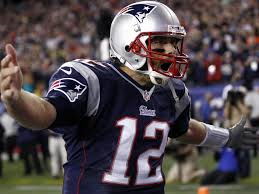 Do you remember those initial weeks of the 2014 regular season when there were increasing discussions concerning Brady's legitimacy as a QB1? He only managed one touchdown in each of his first four games, and couldn't exceed 159 yards in two of those contests. Then, he erupted for multiple scores in ten straight games, including a torrid stretch from Weeks 5-9 in which he amassed 18 touchdowns and just one interception. He eventually finished fifth with 33 touchdowns for the season, which hardly seemed likely after his underwhelming September. But in the process of producing the fifth highest total of his 15-year career, Brady verified that he has not relinquished his residence among the trustworthy QB1s. He also finished 10th with 4,109 yards, which was the seventh time that he has exceeded 4,000. 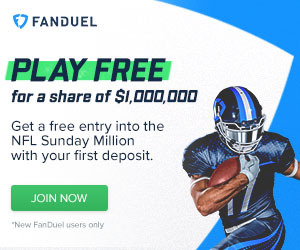 1,124 of those were generated on connections with Rob Gronkowski. Gronk generated an even 100 in Week 5, which coincided with the onset of Brady's dramatic statistical surge. He is healthy, and at a minimum should match the 82 receptions and 12 touchdowns that he collected in 2014. Julian Edelman supplies Brady with another reliable target, having averaged 98 catches for 1,014 over the past two seasons. And Brandon LaFell produced nearly 1,000 yards and seven scores as Brady's WR2. Brady's ability to accumulate fantasy points is not a concern for owners, but the current uncertainty concerning his potential suspension is. That situation should be clarified before late August drafts. But as of this writing, fear that he could miss up to four games is contributing to his ADP of 85. Nine quarterbacks are being chosen before him, but that number will shrink if he will not be reduced to the role of spectator for one fourth of the regular season. Avoid massive uneasiness about his status, as he is worthy of a late seventh round investment. There are sufficient streamer and QB2 options to plug in if he is unavailable. Ryan began the 2014 regular season by producing 10 touchdowns during the month of September, which put him on pace for the first 40 touchdown season of his career. Unfortunately, he only manufactured 18 more during his remaining 12 contests, in great part due to deficiencies throughout the Falcons' roster. Still, Ryan’s 28 touchdowns tied for 10th overall, and represented the fourth time in five years that he has attained that amount. He also generated at least 260 yards in 12 different games, and finished fifth with 4,694 for the year. 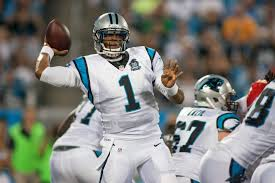 He enters the 2015 draft process as an unquestioned QB1, although his current ADP of 74 underscores the overly aggressive expectations that exist within the fantasy community. It is wise to remember that he has never exceeded 32 touchdowns in a season, and has only reached 30 once in his career. And considering the shortcomings that still permeate Atlanta's attack, do not expect career highs from Ryan this year. He is not adroit at achieving desirable numbers regardless of which receivers are in the lineup. Which makes him more dependent upon the proficiency of his weaponry than many of his peers. Fortunately, new OC Kyle Shanahan is adept at maximizing the talent at his disposal. From 2008-2013, four of his units ranked within the top 10 in total offense, and three were among the top 10 in passing. Shanahan's presence will now benefit Ryan and the entire Atlanta offense, although clear-cut challenges still exist within the Falcon offense. Roddy White is regressing gradually, inadequacies remain at tight end, and the ground game will be suspect yet again. That leaves Ryan largely reliant upon Julio Jones for his production, which will propel Jones to an exceptional season - providing that he can maintain his health. Ryan owners will suddenly encounter a mammoth problem if Jones is sidelined for any length of time. If that does not occur, Ryan’s output should resemble but not exceed his 2014 totals. Leaving potential owners to ask themselves whether that justifies the late sixth or early seventh round pick that will be necessary to secure him. The 6' 5", 250 pound Newton remains a multi-purpose threat to opponents, and possesses the potential to deliver sizable scoring for his owners. But diminishing numbers and the ongoing scarcity of dangerous weaponry surrounding him provide reason for concern that his output will fall short of other quarterbacks with comparable or inferior ADPs. Last year he finished just 21st with 3,127 passing yards, while Brian Hoyer, Derek Carr, Alex Smith and Colin Kaepernick were among those who generated more yardage. That continued a trend in which Newton's total has declined during each of his four seasons (4,051 - 3,869 - 3,379 - 3,127). He also tied for 19th with 18 passing touchdowns, which were the fewest of his career. He did amass the third most rushing yards among quarterbacks, despite injuries to his ankle, ribs and back, which also sidelined him for two contests. And he did run for 50+ yards in each of Carolina's final three games, after accomplishing it only once in the previous 11. Plus, he produced three of his five touchdowns during that span. While he has ultimately been forced to function without the same number of effective targets as his counterparts, he is not completely devoid of options. Kelvin Benjamin amassed nine touchdowns as a rookie, although he must improve upon his 11 drops. Greg Olsen also delivered the first 1,000-yard season of his eight-year career, assembled the highest yardage total among all tight ends, and played on 97% of Carolina’s snaps. But Newton’s options degenerate quickly once he attempts to locate a third or fourth option, although rookie David Funchess should provide Newton with another functional target at some point during the year. I am not suggesting that you should avoid Newton, but you definitely should not reach for him. And his current ADP of 65 qualifies as a reach if you truly examine his recent output. He would be a worthy selection early in before the eighth round, although someone in your league will probably grab him in Round 6 or 7. Even though other mid-round signal callers that will also remain available can provide higher production. Romo generated 34 touchdowns in 2014, which was the NFL's fourth highest total. That was his best output since 2007, and he accomplished it despite attempting less passes than 22 other quarterbacks last season. That included the underwhelming trio of Alex Smith, Brian Hoyer and Kyle Orton. 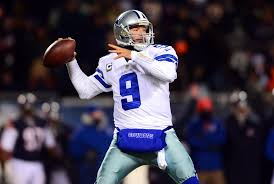 Romo also led the league with 8.5 yards per attempt, which was the second best average of his nine-year career. And he did so while dealing with back and rib injuries. This summer, he enters training camp with his health firmly intact. What it appears that he won't have, is a rusher who can supply the versatility and productivity that was delivered by DeMarco Murray last season. Murray spearheaded a Dallas ground game that ranked second, by logging an astronomical 392 carries, and accumulating a league high 1,845 yards. Murray's durability allowed the Cowboys to run 508 times, and preserve Romo amid his health issues. However, the committee of Joseph Randall, Darren McFadden, Lance Dunbar and the perpetually health challenged Ryan Williams will struggle to sustain Murray's degree of effectiveness, which will force Dallas to rely upon Romo more extensively this year. There is risk that he will not replicate last year's excellent TD/INT ratio without a highly efficient running game to dissuade opposing defenses from focusing on the Dallas aerial attack. However, that scenario also provides Romo will more opportunities to locate his receiving weapons, particularly the immensely productive Dez Bryant - who I do not anticipate to holdout. Romo's elite WR1 led the NFL with 16 touchdowns last season, and there will be ample opportunities for the tandem to connect more frequently. Bryant's 138 targets were just the 12th most in 2014, and were nearly 50 less than Demaryius Thomas and Antonio Brown. Romo will also have Terrance Williams, Jason Witten, and the underrated Cole Beasley to help him attain desirable numbers. While he will not be disappointment to his owners, the quandary for anyone considering Romo is similar to the situation when pondering Ryan. Because his current ADP of 78 is evidence that you will need to draft him by Round 7. Even though comparable options will be available in later rounds. The lack of appreciation regarding Manning’s accomplishments in 2014 were dealt with in my recent column. Just two months ago, he was being selected in the 13th round of standard drafts, despite the fact that he finished sixth among all quarterbacks with 4,410 yards last season. That exceeded the total for both Rodgers and Brady, and was the second highest output of Eli’s career. His 30 touchdowns placed him ninth overall, and represented the second best total since he entered the league in 2004. He also completed a career best 63% of his passes, overcame an ankle injury, and dealt with learning a new offensive system under then first year OC Ben McAdoo. 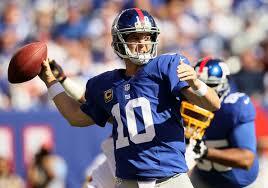 Now, Manning is healthy, and his comfort level with McAdoo’s approach is much stronger. While his ADP has now risen to 101, the success that he attained last season remains overlooked by many. This creates an exceptional opportunity for you, should that lack of recognition continue. Because not only is he primed to thrive in year two of McAdoo’s system, but the other dynamics that propelled his achievements last season remain intact. 18 of Manning’s scoring throws were generated during his last 10 contests in 2014, when he also produced 3,085 yards. It is hardly a coincidence that those numbers coincide with the memorable statistical eruption that was delivered by Odell Beckham Jr. once he entered New York’s lineup. As mentioned in my previous piece on Manning, Beckham should sustain last season’s dominance over opposing defensive backs. Which enables Manning owners to reap the benefits of Beckham’s gargantuan production, even if he isn’t actually on their rosters. While there are questions surrounding the return of Victor Cruz from last season’s torn patellar tendon injury, any contributions that he can make will boost Manning’s output even further. If Cruz is unable to provide significant assistance, Rueben Randle can function sufficiently as Manning's second option. 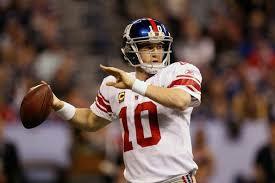 It is undoubtedly clear that I am a huge proponent of drafting Manning. He is worthy of an early ninth round selection, and will outperform other quarterbacks that were chosen in earlier rounds. The Dolphins have demonstrated their confidence in Tannehill during the offseason by making him the sixth highest paid quarterback in the NFL. He begins his fourth season with the new deal in place, and additional pressure to deliver consistent high quality production. 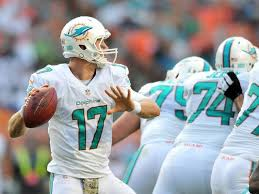 He has improved steadily during his tenure with Miami, and vaulted into consideration as a low end QB1 last season after generating multiple touchdowns in six of eight contests, and rushing for 47+ in four straight games during that span (Weeks 6-9). He finished 2014 with 27 touchdowns, which placed him 11th overall, and established a new career high by throwing for 4,045 yards. While there are aspects of his game that still require improvement, Tannehill is now an even more enticing option due to his ongoing development, and the burgeoning cluster of talent at wide receiver. Offseason additions have presented him with more enticing options than what he had available during his previous three seasons. Even though mercurial Mike Wallace was jettisoned to Minnesota, Miami, 23-year old Kenny Stills nearly generated 1,000 yards as a rookie, and can function as a deep threat. Jarvis Landry will serve as Tannehill's primary option, after finishing second among all rookies with 84 catches in 2014. Rookie DeVante Parker, veteran Greg Jennings, and former Brown Jordan Cameron also comprise Tannehill's stable of weapons. This will be his second year running OC Bill Lazor's offense, which will only enhance his comfort level. Last season, he also amassed 311 yards as a rusher, and should once again supply owners with additional fantasy points through his efforts on the ground. He should produce at least 30 touchdowns, and over 4,000 yards through the air. While that is not a massive jump from his 2014 output, his numbers will be similar to that of several quarterbacks who will be drafted earlier. Which makes his current ADP of 97 acceptable somewhat low. Just do not reach for him before Round 8. It would be reasonable to expect a 27-year old quarterback who is entering his seventh year as a starter to be firmly within his most prolific seasons as a passer. However, that is not the case with Stafford. Instead, there are more reasons for owners to be concerned about drafting him than there were earlier in his career. In 2011, Stafford was one of just three quarterbacks to launch over 40 touchdown passes, and also finished third overall with 5,038 yards. But since attaining those career highs, he has failed to manufacture even 30 touchdowns in each of his last three seasons, and his yardage total has steadily declined each year. While Stafford did finish ninth in yardage last season, his total (4,257) represented yet another decrease from the previous year. He also reached 300 yards in just four games last season, after accomplishing it eight times in both 2011 and 2012. Stafford’s descending touchdown totals are equally concerning, as he finished an alarming 14th among his peers with just 22 in 2014. And after generating at least three touchdowns in seven games during 2011, that number dwindled to just two last season. One of which occurred in Week 17, which was too late for the vast majority of his owners. He has also thrown 64 interceptions over the past four seasons, although the 12 that he accumulated in 2014 were the fewest during that span. While Stafford's brand name has increasingly surpassed his actual productivity in recent seasons, he does still have capable weapons who can help him reverse that trend. Primarily Calvin Johnson, who exceeded 1,000 yards for the fifth consecutive year despite being sidelined for three games. Golden Tate will return for his second season as a Lion, after finishing seventh overall with 1,331 yards in 2014. 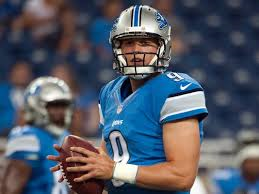 And second round draft pick Ameer Abdullah should provide Stafford with an explosive option out of the backfield. Still, the consistent degeneration of his numbers has dropped Stafford from a high-end QB1 to a low end option, and he should not be selected until at least Round 9 in 12-team leagues. 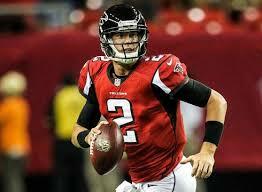 Category - Fantasy Football Draft - Should You Target A Mid-Round Quarterback?